The company was heading toward catastrophe. The executive leadership team knew it – but most importantly, the stockholders knew it. It was time to do something drastic to turn the company around. Leadership came up with a recovery strategy that would take a full five years to implement. It required layoffs. Many, many rounds of layoffs. Every employee wondered if their job was going to be on the chopping block. But to make the strategy successful, it required buy-in from those employees. After all, they were the ones who were doing the work. In the hopes that employee engagement could be stirred, the company communicated. A lot. They wrote blogs and sent out articles. They provided weekly video updates from the CEO. The executive leadership team even did quarterly roundtables, where a select number of individual contributors were invited to ask questions and share their experiences. Unfortunately, cynicism and employee disengagement still ran rampant. Especially once the layoffs began. During this time, the manager of one of the small online merchandising teams was struggling with the morale of her employees. Team meetings were negative, to say the least. Her team of marketers, developers, project managers and data managers were still doing amazing things every day. Even with low morale. This manager tapped on the shoulder of her internal communications expert, and they crafted a plan. Together they created a monthly newsletter that focused on the good things the team was doing. The wins, the role changes, the exciting launches, the inspiring conversations with leadership – they even shared some personal successes in this newsletter. At first the newsletter just went out to the team. Then the broader organization got interested. Then stakeholders wanted to see what the team was up to. Then other organizations saw what was going on and started creating these newsletters for their own teams. Thanks to this newsletter, people started talking about accomplishments. Successes. Wins. Team members found out more about each other, about other teams and about other organizations. This newsletter gave employees a point of connection. A way to engage with one another. A voice. Because employees learned more about each other, it became easier to accomplish the tasks that moved the company toward recovery. Now they knew who to go to for help. And they also knew they weren't going through this experience alone. That's the power of storytelling in action. This newsletter wasn't a bullet-pointed list of projects and tasks completed. It was a collection of stories about the employees. It became a medium for connecting people at all levels and getting important messages across. Employee stories and employee recognition can do more than that, too. They can humanize leadership, foster behaviors and amplify important communications. Above and beyond broadcasting company messages through traditional avenues, authentic storytelling is a potent business tool for internal communications managers. Since cavemen painted pictures of their hunts on cave walls, we humans have loved a good story. But there's more to storytelling than enjoyment. Our brains respond differently to stories than other forms of communication. Informational communication – say a how-to article with bullet points – activates two areas of the brain: Broca's area and Wernicke's area. These areas reside in the language processing parts of the brain, so we can understand the information being delivered. Our brain processes the bullet points and makes meaning of them. But when we hear a story, so much more happens in our brains. Not only do Broca's area and Wernicke's area light up to process the language, but parts of our brain responsible for all five senses activate, too. When a scent is mentioned in the story, the sensory cortex kicks in like we were smelling that scent ourselves. When an action or motion is mentioned in the story, the motor cortex turns on. And so on. Your entire brain joins in the story. For internal communications professionals, the application is clear: The more you engage the brain, the more people can understand and remember the message you're trying to get across. 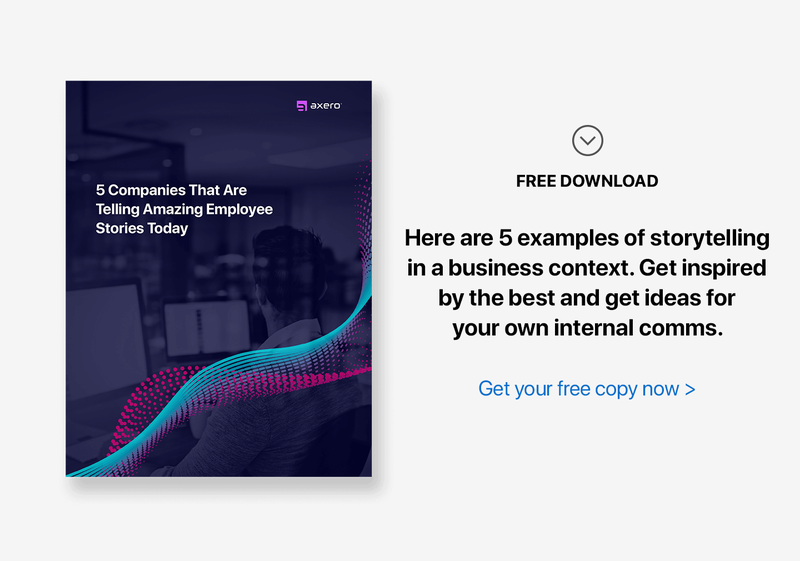 Bonus: Find out which 5 companies are telling amazing employee stories today in this free download. There is plenty of research to back this up. Paul J. Zak's experiments found that people better understood and remembered a speaker's key points when the speaker used character-driven stories with emotional content. Princeton University neuroscientist Uri Hasson found that the same areas of both the speaker's and listener's brains light up when viewed in an fMRI, showing that through mirror neurons, even our brains connect through storytelling. The Emotional Impact of Storytelling in Business. Engaging people's brains is all well and good. But employees also need to function collectively in a business environment to get things done. Storytelling helps with that, too. Stories create a sense of closeness and allow us to connect with others, regardless of our positions. We are social creatures, after all. Our natural human tendency is to relate stories to our own experiences, so we naturally connect with others in this way. There is scientific evidence to show that listening to stories about others can even cause our brains to produce oxytocin, the "trust, cooperation and positive connection" neurochemical. Internal communications managers can use this knowledge to foster a sense of community within a team or organization, and move everyone forward toward the same goal. How to Use Employee Recognition and Storytelling in Your Own Organization. Paint a picture of the future of the company with a vivid story. Set the theme of organizational change with a compelling story. Rally employees to a cause with a gripping story. Help employees connect with and learn about one another through endearing stories. Stories engage the mind, but they also engage the heart. Logic and reason have their parts to play in business – very, very important parts. But emotional engagement results in connection, camaraderie and solidarity. Use employee stories in your internal communication to gain buy-in and increase employee engagement. Here's how. What types of employee stories should you include in your internal communications? Collect lots of stories now – in fact, always be collecting employee stories – and determine their purpose later. The five ideas below will give you a starting point for choosing the right story to match your purpose. First, no matter the purpose of the story, employee recognition should always be authentic and told naturally for the greatest impact. Second, one story may make a dent, but a tapestry of stories will make a difference. Don't stop with one story. Tell many stories to give context, bring life to the message and meet your goal faster. When an individual, team, organization, or the company as a whole has a big win, this is a story worth telling. Did Alan in Sales land that huge new account? Share the story! Especially during times of change or upset, celebrating the small wins can make a big difference in morale. Maybe Madison in IT updated the internal ticketing system to make logging IT tickets easier for the marketing team. This small win is worth sharing! 3. "A Day in the Life" Snapshots. Joe in Accounting might not have any idea what Joanne in Marketing does every day. Tell a "day in the life" story to introduce them. This type of story is a glimpse into the everyday work life of an individual or a team, and it can go a long way toward connection and knowledge sharing. 4. The Truth Behind the Tabloids. Larger companies especially are in the news a lot, and in times of turmoil or change, some of those news pieces may make employees feel uneasy about their jobs. Use internal communications to tell the real story. 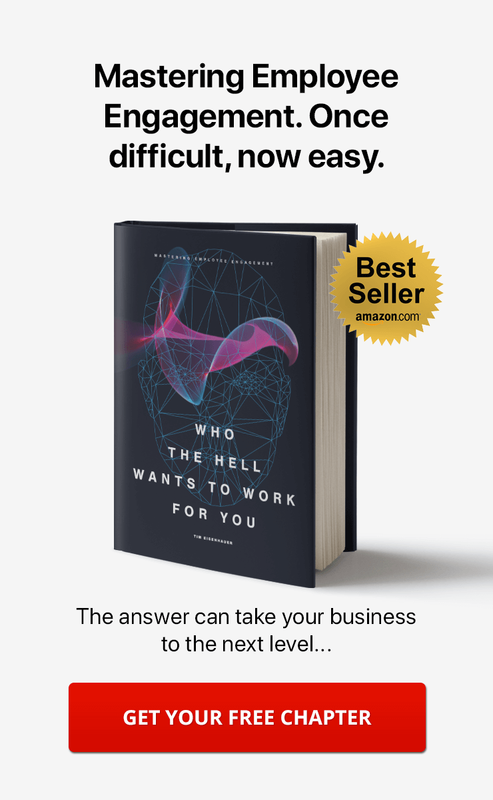 Let employees know the backstory of a strategy decision, loop them in on a gamble that leadership took that paid off, or help employees empathize with what leadership is going through to keep the company going in the right direction. Not every company puts a big emphasis on community service, but if yours does, this is worth talking about in internal communications. Do a spotlight on that food drive. Share photos and soundbites from that fundraising walk. Note that employee who is writing a newsletter for the local after-school kids' program. How to Interview Employees for Authentic Stories. Once you get employees talking about things they're excited about, the stories often tell themselves. The "trick" is to make employees comfortable talking to you, and then point the conversation in the right direction. Ask them employee how they prefer to communicate – phone, email, video call, in person. Have your topic in mind and compile your questions, but leave room for natural shifts in conversation. You never know what you'll learn about someone when you just let them talk! Approach the employee with a sense of openness and curiosity. Make it a friendly, casual conversation, even if you have a long list of questions to ask them. Tap into the emotional element of the story. That is what others will connect with when reading it. Really try to get a sense of how the employee felt during the situation. Don't let the heart of the story get away from you! Tell me your story (or about this moment / situation / event) in your own words. What did you do to tackle the problem? A "20 questions"-style interview. This is especially fun when it's timed. For example, "20 questions in 60 seconds." It doesn't give the interviewee time to overthink their answers, which can result in some very entertaining answers! "Tell me about a time when …" This can be a great prompt to get a truly heartfelt story. Try turning this into a conversation prompt like, "Tell me about a time when you [saved the day, surprised yourself, went above and beyond, made a customer happy]." How to Write Employee Recognition Stories. Now that you have spoken to employees and heard them tell their stories, it's time to write those stories! Many will argue that a story and a portrait are two different things. And maybe they are. But they each have important roles in internal communications. Portraits help employees connect on a personal level. They help employees get to know each other better, which can lead to a better understanding of who to go to for what knowledge. Portraits of leadership – when done in an authentic way – can also humanize leaders and make them more relatable. Stories in the truest sense are engaging. They include a protagonist and a journey that help us empathize even more than a portrait might. Where some internal communications fail in this space, however, is making the protagonist relatable. When a story is whitewashed to show only how someone did the right thing, made the right decision, or towed the company line, it becomes less … human. Instead, tell stories about overcoming challenges, dealing with unexpected change, facing insurmountable odds and winning. Those are the stories that move people. Inciting incident – What happened that moved the person to action? Obstacles overcome – What did they do to address the issue or fix the problem? The Best Places to Publish Employee Recognition Stories. So you've interviewed employees and written the stories. Now what? Now you need to pick the best place(s) to publish them. This, in a nutshell, is picking the right tool to get the right message out. Blog: Best for a broad audience, like an entire department. Blogs are for more casually written, internal stories. Your intranet blog is probably the #1 place you'll post employee recognition stories outside of a newsletter. A bonus of using a blog is the interactive capabilities. People can comment, share and like a post, which gets them more engaged. Article: Best for a broad audience, like an entire department. Articles are also great for broad audiences, but they tend to be more formal in nature. They work best for announcing changes or telling stories about what the company has been doing in the world. Newsletter: Best for team communication. If you're sending a newsletter out via email, it's important that the recipients are on the lookout for it. If they're not looking for it, it will just get lost in the sea of emails already in their inboxes. Here's another option many IC managers forget about: posting the newsletter to the team intranet page. Whether you publish it in blog-post format, or create a downloadable PDF and publish a link to it, your intranet software platform can give you flexibility and bypass those cluttered inboxes. The reason newsletters work better for team communication is because they allow you to tackle more than one topic, but still do it in a personal way. You can communicate information that matters to your team, that might not matter as much to the broader organization. Video: Best for communicating to and across large departments. Our brains process video differently than text. And a lot faster. For communicating across large departments, up the chain or to executives, video is a winning storytelling medium. Wiki: Best for collecting communications that people will need to remember or reference. Does your internal communication convey critical information? Don't just send it out via email, and don't just post it to the team intranet. Make sure you add it to your organization's wiki so everyone can find it quickly and easily. Chat: Best for addressing a small group. Have a win to share with a group or team, and can't wait for the next staff meeting? Send it out via chat for a quick morale boost. Stories Bring Information to Life. Internal communications managers and IC professionals are tasked with communicating mission-critical information every day. 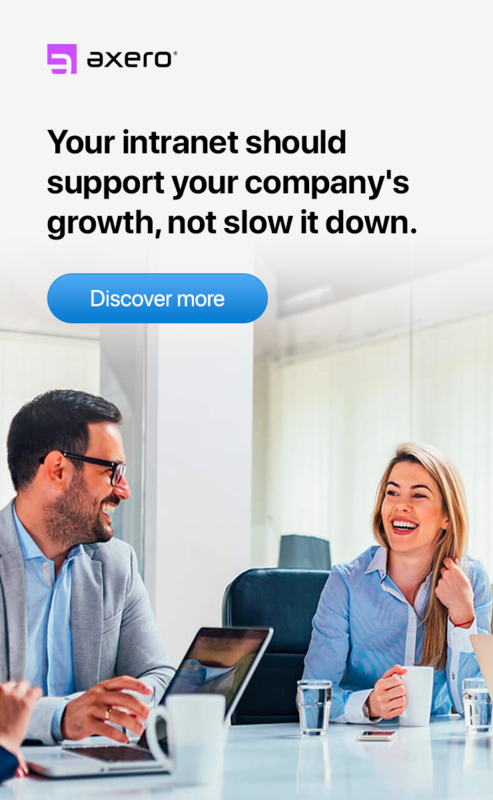 In the busy world of business, making sure these messages not only get received and read, but also get understood and remembered, can be a huge challenge. Stories can make the difference between imparting information and connecting with the audience. Employee recognition stories make internal communications more impactful. Whether the point of a communication is to improve employee engagement, communicate change, gain buy-in, or increase awareness, employee stories help make an emotional impact on the readers – and the result is more empathy and connection with the subject of the story. I've put together a list of five companies who are telling amazing employee stories. You can download it here. Though these might not be internal communications, per se, they are great examples of the power of story in a business context. They'll inspire you and give you ideas for better storytelling in your own internal communications. Enjoy! Thanks for the wonderful blog ! I am now acknowledged by the psychology behind the question "Tell me about yourself" in every interview. We usually make moments of our project as a slideshow and share it with the client. By this they get impressed of how the project was carried out in an effective manner.But we only share the happy part of it. Is it good to include the sad part of it , like the struggles and the hurdles that were experienced ?